The polymer continuously converts greenhouse gas into a carbon-based material that reinforces itself. 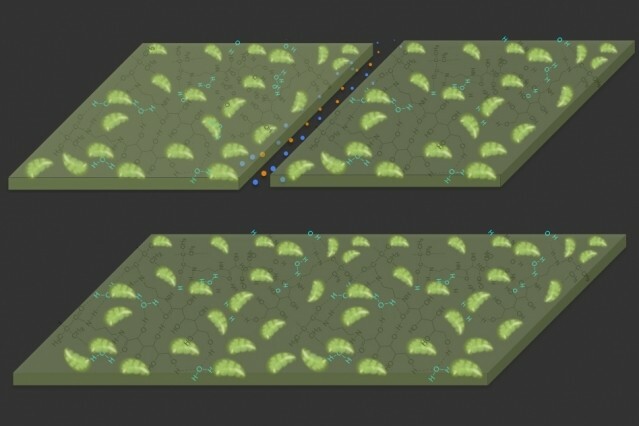 Diagrams illustrate the self-healing properties of the new material. At top, a crack is created in the material, which is composed of a hydrogel (dark green) with plant-derived chloroplasts (light green) embedded in it. At bottom, in the presence of light, the material reacts with carbon dioxide in the air to expand and fill the gap, repairing the damage.